You can hand out candy apples on a stick or pack them up for take-out in our candy apple boxes. These disposable candy apple supplies come in all plastic varieties or paper options. Plastic containers allow customers to see your confections from all sides, while paper boxes feature a window for visibility in the front. The paper candy apple boxes also fold up for compact storage. Also make sure to check out other great items from Baker's Mark, Elkay Plastics and Royal Paper. Use paper lollipop sticks to create a classic autumn treat, and package your candy apples in plastic bubbles or paper candy apple boxes for orders to-go. When you use disposable candy apple supplies, guests can simply throw them away when they're done, too! We offer products in large bulk quantities, so you can stock up on the supplies you need in one convenient order. 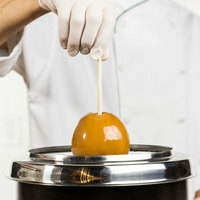 Check out our caramel apple supplies for other products. We also carry plastic candy bags and various sizes of candy boxes for other confections. If you're wondering where to buy royal paper disposable candy apple supplies, we have a large selection of royal paper disposable candy apple supplies for sale at the lowest prices.